Serving home and business owners since 1948, Jeff’s Key & Safe Shop is your master source for any and all locksmith needs. Our licensed technicians offer a full range of locksmith services for residential and commercial settings. Call today for a free estimate! Locally-owned and -operated, Jeff’s Key & Safe Shop has been the premier locksmith in Lawton, OK since 1948. We specialize in both residential and commercial locks and safes. Our services include everything from basic re-keys to CCTV systems and car remote replacement and minor repair. We offer professional, reliable expertise for access controls, duplicate keys, dead-bolt lock systems, garage door locks, master key systems, high security locks, safe sales, safe installation, re-keying and closed circuit television systems. 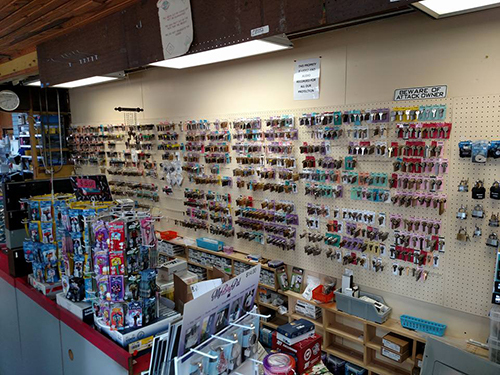 Jeff’s Key & Safe Shop provides over 500 key varieties for complete customization! We are happy to provide a free estimate for your next project. No job is too big or small. At Jeff’s Key & Safe Shop, our mission is to be your trusted local expert for all locksmith needs. With decades of experience, our knowledge and skills are unparalleled in the industry. Our in-depth expertise makes us the leader among locksmiths in Lawton, OK. Well-established in our field, we are a GSA Approved Container and Vault Door Inspector as well as a GSA Certified Safe and Vault Technician. Applying industry-leading techniques, we pride ourselves in delivering top-level service, every time. Contact our lock and safe specialists today to take advantage of the many helpful services we’re proud to offer. We are a locally-owned and –operated locksmith; our business was established in 1948. We provide a full range of residential and commercial locksmith services. We can easily customize locks with our inventory of over 500 key designs. When you need top-quality locksmith service for your home or business, contact the experienced professionals at Jeff’s Key & Safe Shop. "Family owned, great service, good work, very friendly." "Great place fast and friendly service. Always willing to help and offer great advice if needed." "Always friendly! Extremely accurate & very professional!" "These people helped me cut keys for old locks not made anymore." "Fast friendly service, very professional. The young lady that works there normally does my keys and lock re-keys as never got one wrong."